Need a quick light dinner or lunch? 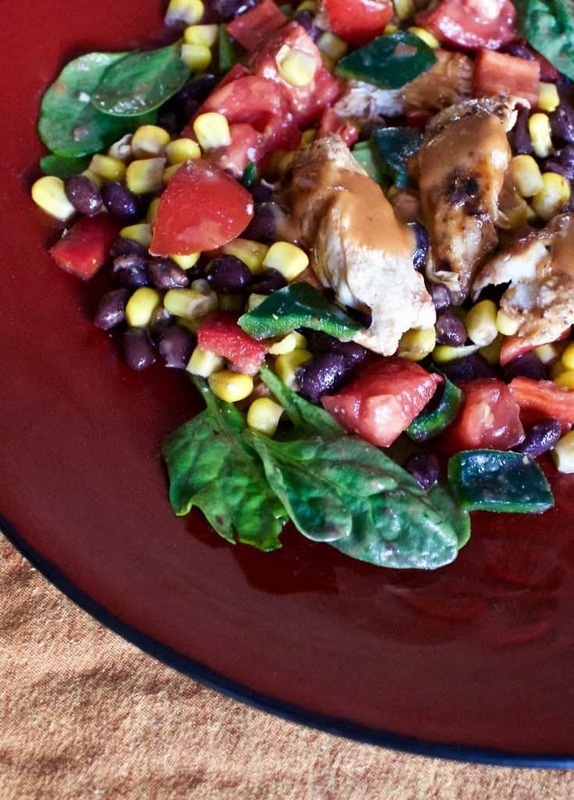 Grilled Chicken Corn Black Bean Salad is on the table in 30 minutes. Invite this high fiber, gluten free, healthy salad to dinner tonight! I’m on vacation in Great Falls Montana! My Grandson, Dane, is two years old this week. My four year old granddaughter, Nora, is mutton busting in the local rodeo tonight! I couldn’t miss either of those events! Too much family fun. I love this area of Montana! The terrain is amazing around here. Great Falls Sits just west of Central Montana. It enjoys a beautiful spot on the Missouri River surrounded by rolling hills and plains. Just West of us is Western Montana. I get to drive through the four different mountain passes on my way home. Lots of beautiful scenery along the way! I’m loving my time with Amanda and Nathan. I miss them so much when we are apart. But it brings me incredible joy and pride to see their family grow and mature each time we visit. I’m so proud of them all! And they are both great cooks!! This is Amanda’s recipe. She taught me how to make this fantastic, Tex-Mex style light meal. I wanted to share it with you! 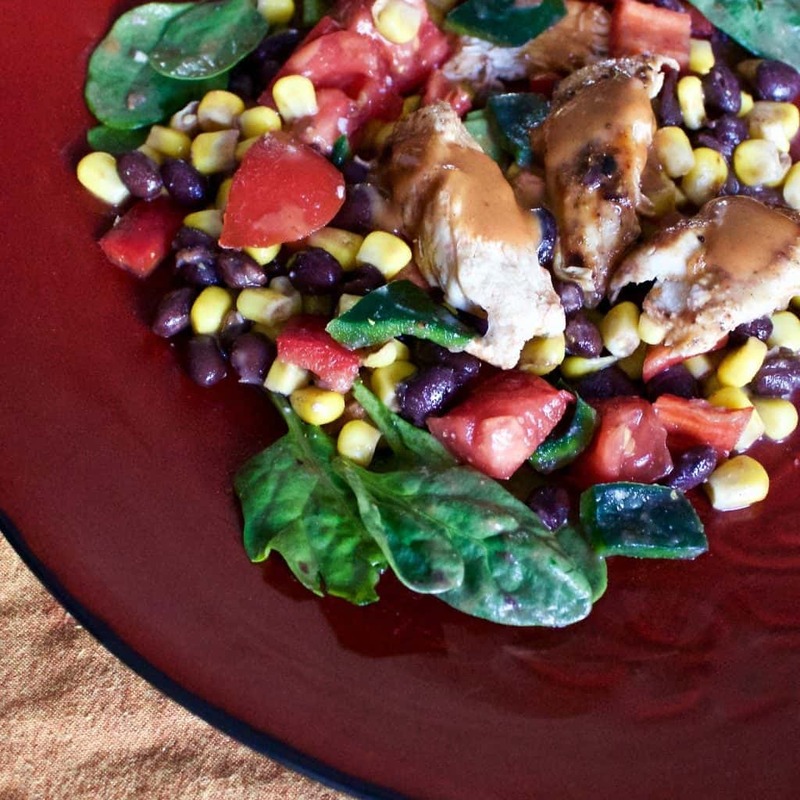 This grilled chicken corn black bean salad is full of fiber and gluten free for a highly digestible, healthy salad. Use it as a light meal or fantastic side dish to my son in law Nathan’s Italian Style Hamburgers. Grill a chicken breast, add a few greens (we are using baby spinach), corn, and black beans for the base. Green and red peppers and bright red tomatoes provide lovely color and flavor. I’m using Our homegrown peppers and tomatoes. Wowsa! The flavor of fresh is just unbeatable! This recipe calls for canned corn. I encourage you to try using fresh corn from the garden or local organic farmers, if you can, for an added dimension of fresh goodness. Tiburon peppers have a tiny bit of heat but taste great fresh, in slices. The sauce is one of my favorite store bought barbecue sauces, Stubbs Sticky Sweet. 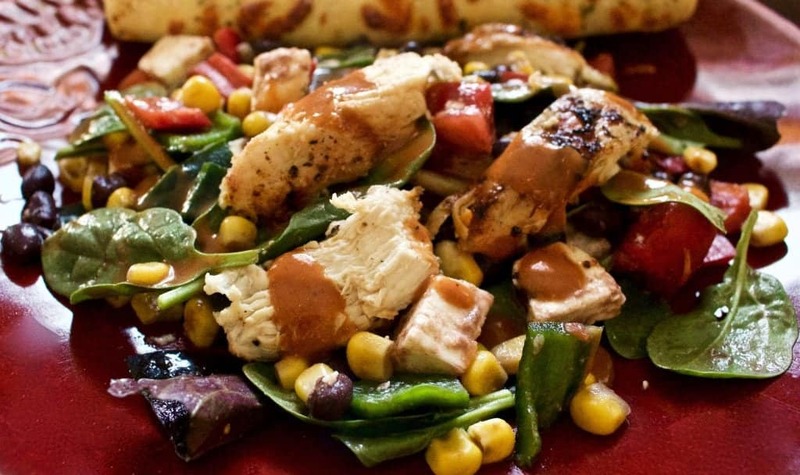 The sweet zing in this barbecue sauce is perfect for this salad. Add a touch of ranch dressing and whisk them together. The sauce becomes a creamy, rich flavorful dressing with a full bodied, salad dressing flavor, and consistency. Brush the chicken breast with the olive oil and season with the listed seasoning to taste. Grill the chicken breast at 325 for 10 minutes on each side, or until juices run clear and the breast is grill marked. Meanwhile, Combine all the ingredients for the salad as described. Whisk together the dressing and serve on the side in a bowl to drizzle on the salad as desired. When the chicken is done remove from heat, cool to handling and slice into strips, as desired. Stir the chicken into the salad. Tex Mex meals are the best! Full of protein and healthy foods! This is a great salad and I could eat it all day! Thanks for linking up to Saucy Saturdays! My pleasure Jennifer! This salad offers a nice bite of Tex Mex Goodness! This salad looks right up my alley, the perfect balance of healthy and tasty! Pinning it to my salads board and plan to give it a try in the near future. Thank you so much Joann! I hope you let us know how you like it! I love grilled chicken on salad but have never tried grilled corn in one! I just know I’ll love it. I couldn’t quite tell, did you use two of those red flame peppers in this? Is it wicked spicy? 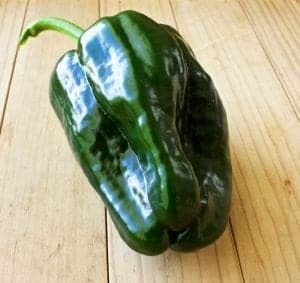 Just got some of those fresh chilis and I’m not quite sure how to use them. Thanks for linking up at #SaucySaturdays. We did use one red flame and one green Tiburon pepper in our salad. 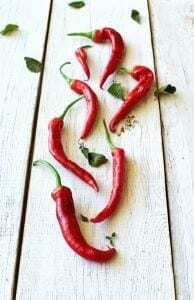 The red flames are spicy but no more than a jalapeno. The Tiburon is a milder pepper more like the pasilla pepper. We didn’t grill the corn, Christine but that’s a brilliant idea! What a fabulous looking salad – loving this! Thank you so much for sharing your amazing recipes with us at #TryaBiteTuesday – we sure appreciate you joining the party! Come see us again!!! I enjoyed the party Debra! This looks very healthy and delicious Pinned and shared! I would absolutely love this salad. I love all the ingredients that you used. Looks like a wonderful Tex Mex type of recipe! I love Mexican and this salad has all the ingredients I love! Great to hear katerina, I hope you love it! Yum, I love Tex Mex flavors and black beans, corn and tomatoes is such a wonderful combination, this salad sounds delicious and perfect for summer! That looks fantastic. I love all the fresh flacked and bright colors. I also love mutton bustin’! It’s our favorite part of the local fair every year. Thanks Diana, watching our granddaughter Nora mutton bust was definitely the highlight of the rodeo for me. those kids are just so cute. So are the sheep. Great fun! Yum! Such a great combo for a filling meal. I think it’s easy to forget that corn, black beans, and tomatoes are great cold, too. Thanks for the reminder and the recipe! Thanks Erin, for the nice compliment. This is a great summer meal! I add ranch dressing to other dressings all the time but I have never added it to barbecue sauce. That’s a great idea that I will have to try! It’s really good Linda. I had never tried it until Amanda clued me in. It made a flavorful,creamy dressing. Yum! It’s like the lightbulb just went off. Why haven’t I heard about adding some ranch to bbq sauce for a shazam type of dressing?!? My 9 year old is sitting next to me, looked at this picture and said we have to make this! Smart boy! I agree with your son, Betsy. You really need to make this and let me know how you like it. It was a hit with us! This salad looks delicious! I love the simplicity of the dressing and the fresh ingredients in the salad. This looks delicious. I like the dressing with a mix of BBQ and ranch. What a great blend! It really is good, Nicky. Thanks so much!